The fancy dress Coconut Grove emerged on Wilshire Boulevard at an auspicious time. In the 20s, Hollywood stars were beginning to define glamour for the world, and press agents were eager to help out. The coconut Grove, which looked as grand as a Zigfield stage provided the ideal backdrop and photo opportunity. Those photographs telegraphed to fans around the world the news of who was walking on whose arm a long day at the studio, as well as displaying the finery everyone wore. 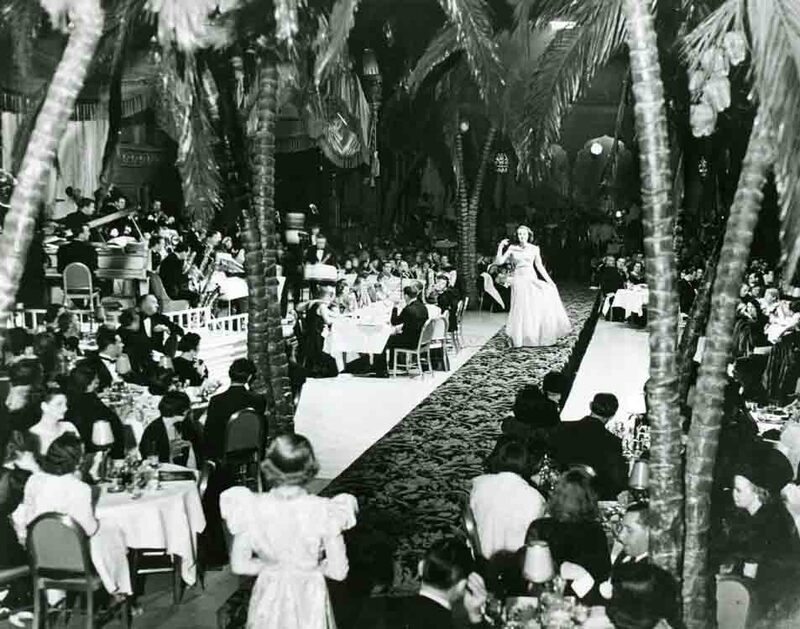 In the late 30s and 40s, live radio broadcast of the big band music of Freddy Martin ( Mr. Coconut Grove) and vocalist Merv Griffin, who many years later would become owner of the Beverly Hilton Hotel, a few miles west on Wilshire Boulevard. 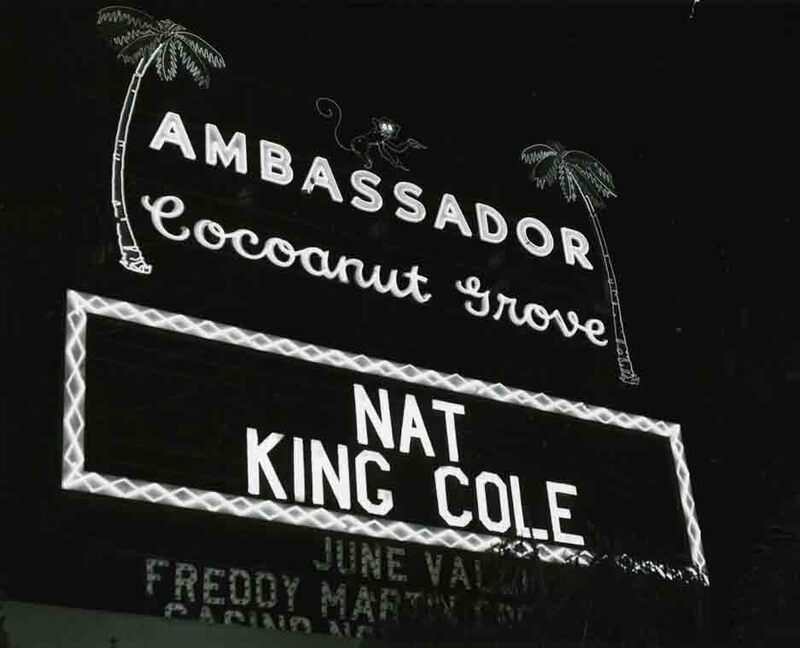 Guy Lombardo, Phil Harris, Ozzie Nelson, and Rudy Valley also played at the famous coconut grove. It was also the site of the Academy award presentations and banquets from 1930 to 1936. The following year the award ceremonies was moved to Grauman's Chinese theater, minus dinner. The Coconut Grove opened its doors in the Ambassador Hotel on April 21, 1921, Four months after the hotel opened for business. The ambassador was a deluxe resort complete with bridle paths and stables, a bowling alley, miniature golf course, Olympic sized swimming pool, even a post office and furrier. Actors Pola Negri, Norma Talmage, Gloria Swanson, John Barrymore, Scott and Zelda Fitzgerald and Wilson Mizner, who loved the original brown derby restaurant were among the notables in residence. 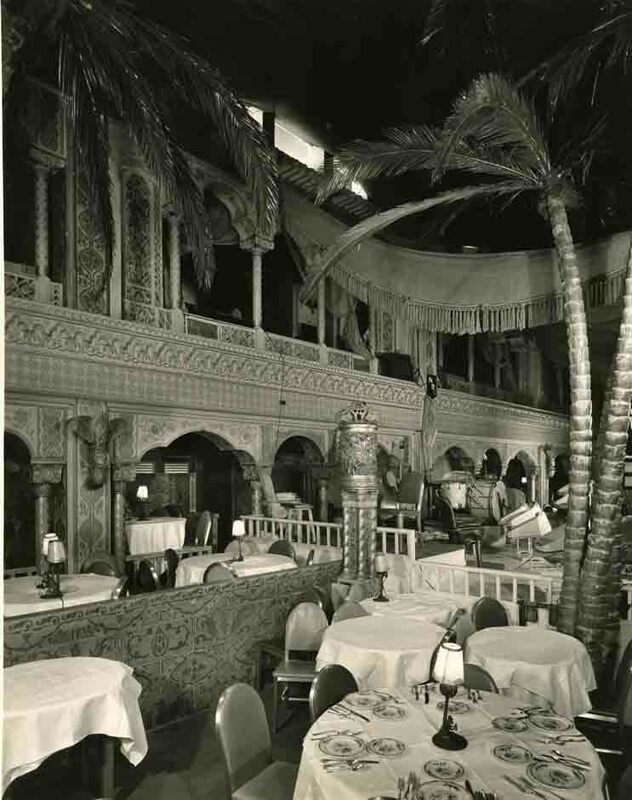 Initially the ambassador or had featured a small nightclub, the Zinnia grill. It was so popular that management converted the hotel's ballroom into a bigger, bigger 1000 seat club. For decor, artificial palm trees were recycled from the set of Rudolph Valentino’s movie, The Shiek. To be sure, plenty of papier-mâché coconuts hung from treetops along with the artificial monkeys with electrically lighted lights. SStars twinkled overhead and hundreds of little lamps flickered on tables positioned around the dance floor. A grand staircase expressly tailored for the grand entrances lead to it all. Eddie Cantor, and later, Nat King Cole, Tony Martin, Judy Garland, Eddie Fisher and Leno Horne. Romances were ignited here, including that of Jack Benny and Mary Livingston, whose first date was under the coconuts. Here, also, careers were regularly launched. As chronicled in Margaret Burk’s book, Mack Sennett discovered Bing Crosby performing on stage, and Joan Crawford frequently bagged trophies in the club’s regular dance contests. The hotel's French chef, Henri, was inspired by a bounty of local produce and fish to create an early version of French California cuisine. He designed dishes highlighting oranges, avocados, grapefruit and asparagus, as well as local abalone, San dabs, and tiny California oysters, which were served both raw and cooked. One of the most popular dessert concoctions utilize the ubiquitous Southern California big. In the 50s, the room was modernized, but throughout the decade and into the 60s, the club was losing its luster. Tastes in entertainment changed, and the mid-Wilshire area was no longer stylish or convenient for people living on the Malibu and Beverly Hills axis. for history's sake, the ambassador will be remembered as much for its past glamour as for tragedy. On June 5, 1968, Robert F Kennedy was assassinated in the ambassadors Embassy room during his California presidential primary victory celebration. The Coconut Grove was reinvented in 1970 with the help of Sammy d'avie Jr., who arrived by motorcycle to launch the new Grove with glitzy, Las Vegas style acts such as Sonny and Cher and Diana Ross. But in 1989, the venue and the hotel closed for good. A group of investors, including Donald Trump bought the hotel and acreage and the Los Angeles school board looked into plans to demolish the historic building and construct a high school on the grounds. As of this writing, the building still stands. Also living on are the memories of some of the sophisticated dishes and cocktails concocted inside. Visit hollywoodphotographs.com to view many Cocoanut Grove photos.